Keping N.C. Roadsides Clean Become an AAH volunteer and help keep North Carolina roadsides litter free! Apply today! Visit www.ncdot.gov/~beautification for more information. Frequently asked questions about the AAH Program. Roadside litter pickup safety information and the “AAH Safety Training” online video. An online application to start your adoption process. The NCDOT established the AAH Program in 1988 in response to growing public concern regarding litter along the state’s highways. AAH is a volunteer driven litter cleanup program. It is a partnership endeavor between community volunteers and the NCDOT. Since its inception, thousands of AAH volunteers have worked to keep N.C. roadsides clean. There are some 6,000 AAH groups that have adopted approximately 12,000 miles of N.C. roadsides. 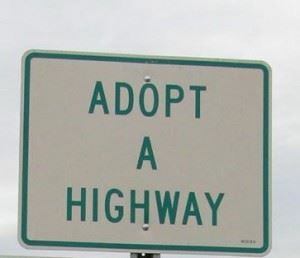 Each county has its own AAH coordinator who coordinates the adoption process and works with each applicant to choose a two-mile stretch of state-maintained highway to adopt. Please refer to the enclosed telephone list for your county coordinator’s contact information. An adopting group enters into a four-year agreement with the NCDOT. In the agreement a group agrees to clean its adopted highway a minimum of four times per year, or more if necessary. Orange safety vests to be worn during a pickup. Orange bags for miscellaneous litter and blue bags for items to be recycled. “Litter Pickup in Progress” safety warning signs. The AAH coordinator will put up two signs; one at either end of the adopted highway to acknowledge the group that has taken responsibility for cleaning the roadside. The Office of Beautification Programs can be reached at 1-800-331-5864.